Spokeeasy is a pedal-powered, eco-friendly, pub-crawling trolley for up to 14 people at time. The bike is powered by YOU and your fellow pedalers. It’s hard not to have a great time on the Spokeeasy! -Go on a tour of the town, pubs, or dinner routes. -BYOB! Bring your own beer! Sorry, NO GLASS OR LIQUOR ALLOWED for the obvious reasons and only malted beverages can be consumed on the bike. 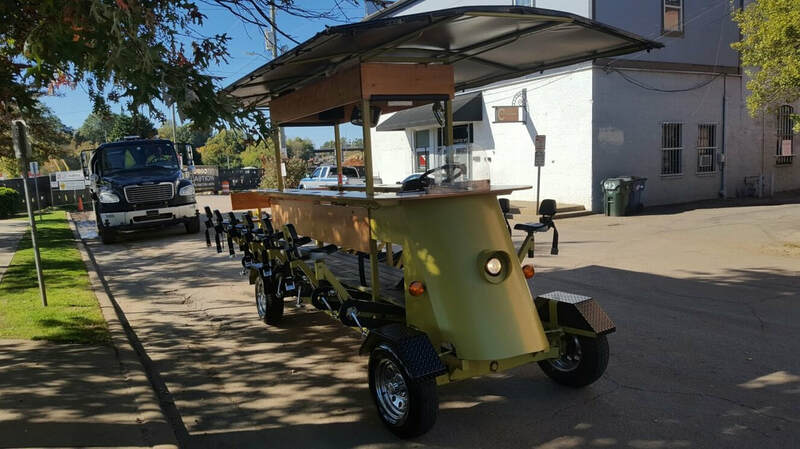 Our pedal-powered pubcrawls are our most popular tour. We can accommodate up to 14 people in one group. Choose from our Downtown or Riverfront routes. Feel free to BYOB and get ready to have the pubcrawl of your life! Want to try the Spokeeasy but don’t have enough people to fill a full tour? No worries! On Mixer Tours, you can buy individual spots on the Spokeeasy for only $30 a seat & start the night right. Would you like to use Spokeeasy at your next special event? We can bring the Spokeeasy to your location. Perfect for weddings, birthdays, corporate events & more. Can't find the answers you need on our website? Shoot us an email to wausauspokeeasy@gmail.com! DNA PARTY BIKES, LLC ​ALL RIGHTS RESERVED.